Dental x-rays are performed yearly or more often if your dentist tracks the development of a dental problem or treatment. If you are a new patient, your new dentist will probably perform dental x-rays to get an accurate picture of your dental health. 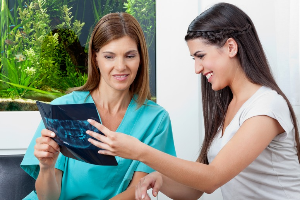 Dentists apply dental x-rays to monitor the oral wellbeing of patients and to diagnose various oral health issues before they trigger irreversible damage. There are many types of dental x-rays for different needs as well. This method lets you bite down a certain piece of paper to allow your dentist see how well your teeth’s crowns match up. It’s used to find out decay between the teeth and bone loss for severe gum disease. This type of dental x-ray captures all your teeth with just one shot. In this technique, the machine will swivel around your head. Your dentist may use this to inspect your wisdom teeth, aim for implanted dental appliances, or examine jaw issues. This method concentrates on two complete teeth, right from the root to the crown. This is applied to check problems underneath the gum line or in the jaw. It shows the mouth’s floor or roof and used to detect extra or hidden teeth beneath the gums, jaw fractures, cleft palate, cysts, and abscesses. The x-ray also includes finding a foreign object. Reveal areas of decay, such as in between teeth, that can’t be seen with an oral exam. Getting dental x-rays helps your dentist envision dental issues of the teeth, including surrounding tissue, that are not visible with a simple oral exam. Here at Bondi Dental, we assure you that we provide the newest form of technology there is for dental x-rays, for a safer procedure and accurate results. We help you prevent incoming oral health concerns that may occur in the future with our first-rate dental x-rays. Modern Dental X-rays Made Easy: How Does It Work? Why You Need Tooth Extraction?